Woo! Glad they're finally getting around to this. I saw a post in the thread at Skylanders Imaginators forum that this was street dated for Dec 31 and needed an override. Hopefully that gets cleared up. I've never successfully gotten my store to sell me a street dated item early, even when I find it on the shelf. Nice to see US packaging for this. One in Whitehall, PA at TRU. Edit: I found four more down the aisle. Bought mine last night, also in Virginia. Manager did have to do the over ride for the 12/31 release. He actually laughed about it. Kind of bittersweet since I know that this will be my last Skylanders purchase before my son and I start selling all of our collection we have built for the past 5 years. North of Metro Detroit TRU's show the item DISCONTINUED & NONE in stock anywhere ! Called all TRU in Grand rapids and Portage Michigan and they all said discontinued and none in stock. I gave the SKU# as well. I hope they get these in and am acctually able to get one before scalpers jump on them. Tried a couple TRU's here in Phoenix, AZ and they show the item as discontinued (so their system won't look at the inventory of every store). The TRU item # is 279146 to make it easier to ask them to check. The TRU drone did mention that their computer systems were totally whacked out right now since their IT dept was in Florida in the hurricane zone. Another store mentioned that their IT people had tried to enable WiFi for customers in their store and blown up their entire system. Registers and hand-helds included. What a mess. The street date has been lifted, people have reported buying them today at the register without issue. On a whim yesterday afternoon, I called one of my nearby TRU's and asked about LIM. The guy went away for ~4-5 mins and then came back saying he had ONE left! NICE! They held it for me and now the collection is complete! This was a TRU in Phoenix, AZ BTW (3rd & Bell) but I did not check Arrowhead for anyone local..
My TRU only had one left when I was there Sunday. Just curious, anyone seen a restocking of LIM? Early reports were most stores were only getting one case, which is 6 items. I haven't seen anything about restocking beyond that or if LIM will show in other stores. Sigh I now got the last Lost Imaginite Mines from Sterling, VA and now am done with the game. I will miss you so much Skylands . 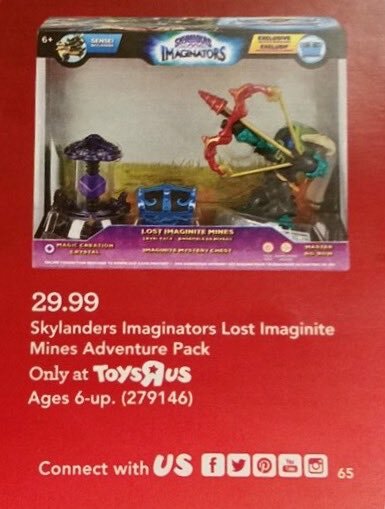 FYI, Lost Imaginite Mines adventure pack is advertised in US Toys R Us's holiday catalog, and it says, "Only at Toys R Us". Credit to @sclmatt and George H. for photo and info. I received this in the mail today. What a sad fall from the pedestal for Skylanders to be relegated to a small one item footnote in a 120 page holiday toy book. Thanks to @sclmatt for info. Walked into my local Toys R Us, in Milwaukee, WI, when it opened Thursday morning - they had a dozen on the shelves. I was so happy to finally get one! Glad my order to Italy for one of these never went though. Now if they'll get some normal Chompy Mages comes in then we'll all be set! I'm about an hour from the nearest Toys-R-Us, and I don't know whether they'll get a shipment in (or if it's already been in and sold out). At this point, low Ebay price is $35. I'm debating whether just to get it, since gas alone will be more than $5, or if I should gamble that there'll be overstock and prices drop ridiculously low during Black Friday, and/or TRU will end up offering it online. Either way, it's a better (full) price than I'd be paying right now just to have it shipped to my door off Ebay. For piece of mind, should I just do that? I don't need it til Christmas (giving the kids the full set), but I'll be kicking myself if TRU does sell out and Ebay prices go up. Edit: Well, I feel sheepish. TRU has already put it up online. Now the question is, do I wait for a sale? They had a buy one get one 75% off sale last week. I see the website listing him as limited stock now. But honestly you probably shouldn't wait any further. Thrillipede was out for like one week on the website before he became rare and hard to get, if that's any indication. You know he's rare and he's probably the last set you need to unlock game content. Certainly worth $35 at this point in time. And $35 isn't that much money really as it's unlikely you'll find him for much less than that anytime soon. Black Friday is probably too much of a mad house to fuss with just for one figure. 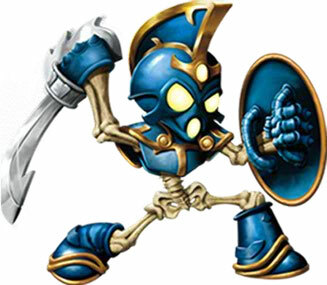 Although TRU does run killer Skylander sales for months, I feel the chances of finding him on a discount without having to buy a ton of other figures will be very low and not worth the fussing around. Yeah, I think I'm about at that point. I just need him and Pit Boss. Tempted to get them both just to have it done with. Any preference between regular or legendary? Just cosmetic, really?